I saw Road House on Youtube. The movie took a while to build up. Richard Widmark's character was neglected pretty much until about the middle of the movie. I didn't mind the slow build up because I felt that the plot was building up to be pretty good. That went away as soon as the plot went into the stealing of the Road House money. From that point on the script was unbelievable and pretty much a waste. ONLY because of Widmark do I give this a 5 out of 10. Its a 3 without him... The film stars Ida Lupino, Richard Widmark and Cornel Wilde. I saw Road House on Youtube. It the film took a while to build up. Richard Widmark's character was neglected pretty much until about the middle of the movie. I didn't mind the slow build up because I felt that the plot was building up to be pretty good. That went away as soon as the plot went into the stealing of the Road House money. From that point on the script was unbelievable and pretty much a waste. ONLY because of Widmark do I give this a 5 out of 10. Its a 3 without him... The film stars Ida Lupino, Richard Widmark and Cornel Wilde. I rate Road House higher than you do, mainly for the two female stars. Wilde is just OK (like he is in most films), and since he is a big part of the film, that does drag it down. As noted Widmark is fine (a somewhat more controlled deranged at this stage of his career) and clearly the main reason to watch. I love this film. Ida Lupino is usually associated with the Warner Brothers films she made, but personally I think her stuff at Fox is better. ROAD HOUSE being a prime example. She's also great in Fox's THE ADVENTURES OF SHERLOCK HOLMES (1939); Fox's LIFE BEGINS AT EIGHT-THIRTY (1942) which is a comedy that pairs her with Cornel Wilde; and Fox's intriguing film noir MOONTIDE (1942). I'd like it very much if TCM made her Star of the Month again. She's also great in Fox's THE ADVENTURES OF SHERLOCK HOLMES (1939); Fox's LIFE BEGINS AT EIGHT-THIRTY (1942) which is a comedy that again pairs her with Cornel Wilde; and Fox's intriguing film noir MOONTIDE (1942). I agree that the work Lupino did at Fox was often better than what she did at W.B. 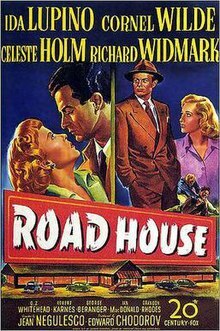 This is why for Road House I posted "mainly for the two female stars"; (Holm was also fine in the film). Lupino as SOTM was one of the better SOTM showing since it had a nice mix of her early Columbia works (ok, not enough but some), her WB period and loan-outs, her Fox period, and of course Lupino as a director. I haven't seen Life Begins at Eight-Thirty: Do you know if TCM has ever shown that film? I don't think TCM has aired LIFE BEGINS AT EIGHT-THIRTY. I was disappointed they did not include it when Monty Woolley had a Summer Under the Stars tribute. It would also work in December, since he plays a department store Santa at the beginning of the story. It has aired on the Fox Movie Channel (FXM Retro, is that what they're calling it these days? ), and it was also released on DVD as part of the Fox Cinema Archives series. I had no problem with Cornel Wilde. The script became unbelievable to me. There were parts about Wilde character and the situation he found himself in that were a stretch to me. Toward the end when they were in the cabin and Suzie tells she has a copy of the receipt proving that Pete was innocent and she thinks that he is not gonna come after HER and the receipt and go after Pete and Lily? I gotta see Moontide. I like Jean Gabin. I will review it after when I get a chance. Ida was pretty good in Road House. Like I said above my problem was more with the plot itself. Moontide is worth seeing for both Gabin and Lupino (as well as Claude Rains and Thomas Mitchell). Solid, moody film. TCM shows it from time to time. (and being a Fox film, that says something). PS: yea, there were some major plot holes in Road House; e.g. the judge letting Wilde avoid jail time if he agreed to be a 'servant' for Widmark. According to MovieCollector's database, MOONTIDE has never aired on TCM. But I thought it had. 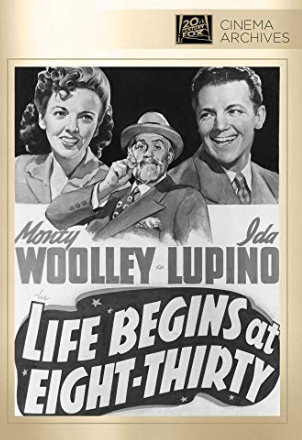 LIFE BEGINS AT EIGHT-THIRTY definitely has not aired on TCM.